d3 Technologies will showcase the 4x4pro and industry first Video Format Conversion cards, as well as the latest r13 software, at InfoComm 2016 at the Las Vegas Convention Center, June 8-10, 2016. d3 will be exhibiting at stand #C6248. d3 will show its flagship 4x4pro with Video Format Conversion (VFC) Quad-SDI output cards. d3’s VFC output cards are an industry first: no other media server on the market offers the ability to gracefully transition from HD to 4K. 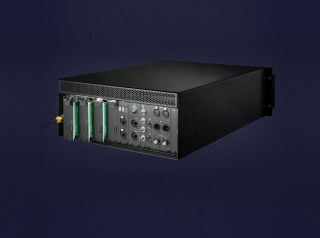 The VFC cards enable users to drive up to 16 HD or four 4K DVI outputs (1080p, 60Hz) from a single 4×4pro system so large, multi-projector shows can be delivered with fewer machines and no downstream splitter devices. This reduces cost, rack space, set-up time and complexity without adding signal latency. The 4x4pro ships with standard DisplayPort 1.2 VFC cards to drive up to four 4K outputs per server. They can be swapped for Quad-DVI or Quad-SDI cards as needed. Also on the d3 stand will be the 2x2plus, which brings the versatility and flexibility of the d3 platform to small events, theatres, fixed and architectural installations where budget is key but performance is critical. The d3 2x2plus supports a wide array of codecs: DXV, HAP, HAP-Q, PJPEG and QT Animation. It drives two 2K outputs and has an extra output for the GUI; it plays 8 HD content layers (DXV/HAP) and two HD lossless content layers (QT Animation). The server has up to 16K pixels content canvas size and offers on-board or pro audio and dual 1Gbit/sec Ethernet. d3’s new r13 software release will also be highlighted with a mix of new and improved features, including a refreshed new look UI and new HMSF timeline which enhances the well known d3 workflow as well as improvements to matrix control, time code readout module and an upgraded web module.